A hearty rice dish with a strong Caribbean influence — featuring ground meat and vegetables in a delicious sauce served with fried plantains and eggs. 1 Heat the oil in a saucepan and stir-fry the garlic until golden brown. Add the shallots and stir-fry until translucent. Add the tomato and cook until it softens. 2 Add the beef, pork, soy and Worcestershire sauces, and cook over medium heat for 15 minutes or until the meat is browned. 3 Add the raisins, salt and pepper, and stir constantly. Add the peas and braise for a further 5 minutes. Remove from the heat and set aside. 4 In a skillet, heat the olive oil and fry the plantain slices until they are soft and caramelized on both sides, about 5–7 minutes, and set aside. Then fry the eggs in the skillet sunny-side up. 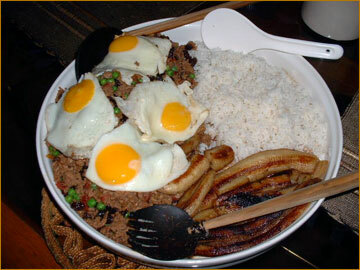 5 Arrange the cooked rice, meat, fried plantains and eggs on a large serving platter. Serve hot.